The program began with Haydn’s Cello Concerto in C Major — a 1961 rediscovery—rather than the well known one in D major (ca. 1772). The soloist, Norwegian native Truls Mørk, played beautifully throughout his third BSO appearance. He seemingly led the orchestra much of the time, and that is what is really needed in this kind of music. But Blomstedt took care to shape the background — especially the accompanimental melodic line and clear dynamics; the ensemble itself (2 oboes, 2 horns, strings 4-4-3-2-1) was intimate enough that it hardly needed regulating. Nevertheless this small group provided a good opportunity to observe how Blomstedt conducted — small, well-contained beat, mostly with wrists and hands, sometimes forearms, and no baton, but always with perfect timekeeping. A fine sense of unity of music-making showed up especially in the eloquent strings-only slow movement’s fine expressive pianissimo (without mutes), and the brilliant finale, a real Allegro molto with abundant 16th notes everywhere, plenty of A-string melody, high-register passage work, and a lot of bariolage for which the cello in C major is particularly suited. Haydn couldn’t have written the low C for the double bass, but he may well have imagined it, and one heard it gratefully at the bottom of the small orchestra. After the intermission the stage filled completely for the Brahms. The strings sat in German style, with the second violins opposite the first and in front of the cellos for a fearless and perfectly controlled performance. One could even call it relaxed, because of its total assurance. The brass, about which I have often complained when other conductors are on the BSO podium, were never too loud, not even in the “chorale” near the end of the finale. Richard Sebring’s sunlit breakthrough horn (in lieu of alphorn early in the finale) sounded just right. I didn’t see who was the timpanist, but the famous crazy-chromatic beginning of the first movement, one of the most remarkable initial gestures in all orchestral literature, sustained a doom-stroke on two timpani tuned to the same tonic C with perfect clarity — never mind that the basses are playing the same beat an octave lower, and the contrabassoon two octaves lower. The principal hazard in performance of Brahms’s orchestral works comes from his preference for blended textures, which often tend to thickness and even muddiness when there is too much rhythmic and melodic variation within a narrow space — the third movement of the Third Symphony is a notable example, the opposite of what soloistic-minded symphonists like Berlioz and Mahler perfected. But Brahms’s dangers can be overcome by utmost attention to rhythmic precision and balance among the instrumental groups, and that is certainly what Herbert Blomstedt commanded in this performance. His direction was both exacting and exact; he moved and gestured entirely in proportion to what the music calls for, never once with exaggeration, and he conducted from memory. The orchestra was entirely in sympathy and gave him their full attention. One could measure this sympathy in part by the curtain call; while the audience was already on its feet, and soloists already singled out (John Ferrillo’s beautiful oboe; the entire horn section; many others), Blomstedt returned for the third or fourth time, gesturing for the orchestra to rise and share the applause, but they remained seated, deferring the honors to him; the audience saw this and cheered even more. Ed. Note: We corrected the attribution of the horn solos. On Thursday night Mørk gave us an encore; did he also do one on Friday? If so, what was it? I didn’t recognize it, all I could tell is that it’s NOT Bach, and my knowledge of solo cello repertoire is, sadly, somewhat limited. 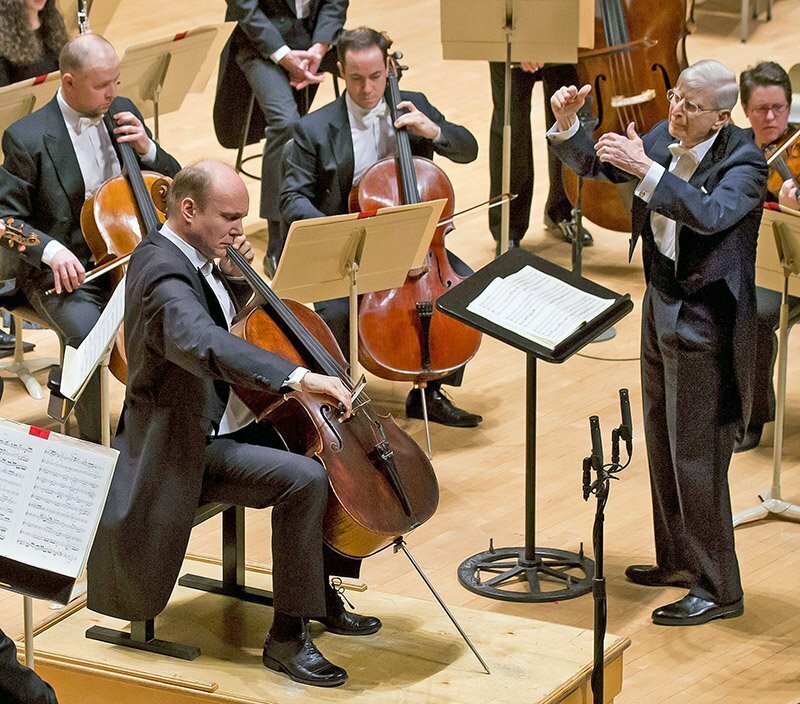 I wasn’t there on Thursday, but the BSO verifies that Mørk’s encore was Bach’s Sarabande from Suite No. 2 in D minor, BWV 1008, for cello. There was no encore on Friday. There was no encore on Friday afternoon. There never usually is one. People are anxious to get out before the rush hour begins. According to the #BSO the encore on Thursday was Bach Sarabande from Suite No. 2 in D minor, BWV 1008 for solo cello. James Somerville? not on Friday or Saturday. Anthony is correct. I tuned in last night and heard Ron della Chiesa credit Richard Sebring with the horn solos, as well as Elizabeth Ostling ditto the flute. Didn’t compromise the performance one iota, which was intense and dramatic (and kudos to Blomstedt for taking the exposition repeat!). Thanks to Mark DeVoto for the timely review!